It’s been 17 years since Hugh Jackman’s rough and laconic Wolverine clawed his way into pop culture. Yes, Wolverine is strong, and he’s great to watch. But can we truly connect with a guy who quickly heals from gunshots or stab wounds? In Logan, the final installment of the Wolverine trilogy (and Jackman’s final appearance as the character), we can connect. As its title suggests, the film offers a more intense exploration of the human and therefore, more vulnerable, side of the protagonist. It’s not the all-powerful Wolverine, but rather the ageing Logan, a hard-drinking and world-weary has-been just hoping to retreat. Both he and Charles Xavier (Patrick Stewart), former head of Xavier’s School for Gifted Youngsters (i.e. mutants), are deteriorating, and the feelings the film evokes captures this sense of loss. But don’t put on your bonnet just yet. 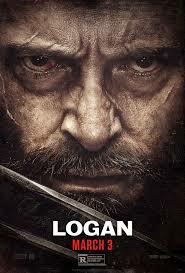 Logan, directed by James Mangold, delivers all the skin-piercing, bone-breaking, head-lopping, full-throttle maniacal violence for which Wolverine is known. It even has the classic Wolverine roar. The year is 2029, and the world is bereft of the original mutants, with the exception of Logan, nonagenarian Charles, and Caliban, a tracker with a severe aversion to the sun. They’re shacked up in a remote Mexican outpost. Logan regularly takes his limo over the border into Texas to scrounge up enough money to medicate Charles with pharmaceuticals and himself with alcohol. He hopes to save enough to buy a boat and live out the rest of his days at sea with Charles (and away from humanity). Then Laura, a girl with a familiar mutation, enters the picture. Logan’s initial response to Laura’s guardian’s pleas for help isn’t the most heroic. He must overcome his demons to help Laura get to a place called Eden, where she can meet up with her fellow lab-manufactured escaped super-children. But there’s a catch: Eden might not be real. Thus the unlikely trio of Logan, Laura, and Charles embarks on an adventurous road trip filled with pain, discovery, and hope. In the meantime, the lab has sent out bounty hunter Donald Pierce with his mechanical hand (never explained or used impressively) and his goons to retrieve Laura and the other child mutants. Moreover, the lab is cooking up something that’s stronger than all these kids and that will, of course, be another of Logan’s obstacles. One character tells Logan that in her nightmares, people are hurting her. He says that in his, he’s hurting others. He’s not talking about the enemies he ploughs through, but rather those to whom Logan gets close. Pain is a constant companion to Logan. He has repeatedly dealt with physical agony, but the emotional turmoil has inflicted more damage. And what a remarkable job Jackman does, whether he’s limping or grieving, in conveying both. One of the most poignant aspects of this film is the relationship between Logan and Charles. Logan, worn down by loss, has no interest in helping others. And yet, in his own gruff way, he serves as Charles’s caregiver. Sometime before the start of this story, Charles has, in his early dementia, used his mind powers to do something terrible on the East Coast. However, even in his intermittent mental fog, Charles encourages Logan to help the mutant cause, while always showing respect to the human race. Stewart, shedding his professorial demeanour and even dropping some f-bombs, offers a moving performance. If you look at the posters of the first three films in the X-Men canon, you will likely see in the forefront the same character: Wolverine. Of all the mutants, he remains a favourite among the masses. Perhaps it’s because he rolls his eyes at the whole superhero thing; he’s not interested in capes and masks. With his outbursts and his pain, Logan reminds us of ourselves... minus the use of metal claws to hack off limbs, the indestructible adamantium skeleton, and the ability to withstand bullets, knives, explosions, fire and flesh-stripping winds.